Many of our readers are often surprised that a medical doctor and nurse devote a portion of their writing to dental issues. Few people who are otherwise medically prepared seem to devote much time to dental health. History, however, tells us that problems with teeth take up a significant portion of the medic’s patient load. In the Vietnam War, medical personnel noted that fully half of those who reported to daily sick call came with dental complaints. In a long-term survival situation, you might find yourself as dentist as well as nurse or doctor. 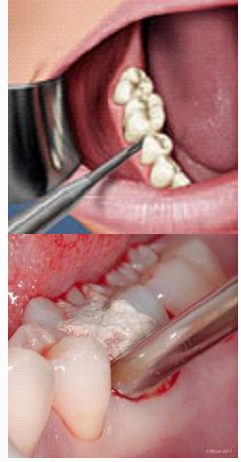 The basis of modern dentistry is to save every tooth if at all possible. In the old days (not biblical times, I mean 50 years ago), the main treatment for a diseased tooth was extraction. If we find ourselves in a collapse situation, that’s how it will be in the future. 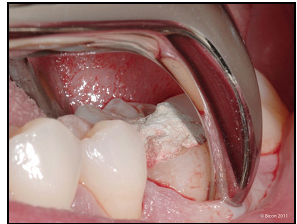 If you delay extracting a tooth because it “isn’t that bad yet”, it will likely get worse. It could spread to other teeth or cause an infection that could spread to your bloodstream (called “sepsis”) and cause major damage. Like it or not, a survival medic, will eventually find himself or herself in a situation where you have to remove a diseased tooth. Tooth extraction is not an enjoyable experience as it is, and will be less so in a long-term survival situation with no power and limited supplies. Unlike baby teeth, a permanent tooth is unlikely to be removed simply by wiggling it out with your (gloved) hand or tying a string to it and the nearest doorknob and slamming. Knowledge of the procedure, however, will be important for anyone expecting to be the medical caregiver in the aftermath of a major disaster. Before we go any further, I have to inform you that I am not a dentist, just an old country doctor. Please note that this is an introductory article, and that tooth extraction can be a complex procedure. Also note: It is illegal and punishable by law to practice dentistry without a license. The lack of formal training or experience in dentistry may cause complications that are much worse than a bum tooth. If you have access to modern dental care, seek it out. To extract a permanent tooth, you will, at the very least, need the following: A dental extraction forceps (#150A is a good general one for uppers a d #151 is reasonable for lowers; they get much more specialized for each type of tooth, however). A periosteal (meaning “around the bone”) elevator instrument to loosen the ligaments holding the tooth in place. A typical dental elevator (see above) Gauze or cotton rolls or squares and a “pickup” forceps or tweezers. A very cooperative patient or a good local anesthetic. Proper positioning will help you perform the procedure more easily. For an upper extraction (also called “maxillary extraction”), the patient should be tipped at a 60 degree angle to the floor and the patient’s mouth should be at the level of the medic’s elbow. For a lower extraction, (also called a “mandibular extraction”), the patient should be sitting upright with the level of the mouth lower than the elbow. For right-handed medics, stand to the right of the patient; for left-handers, stand to the left. For uppers and most front lower extractions, it is best to position yourself in front. For lower molars, some prefer to position themselves somewhat behind the patient. To begin with, you will want to wash your hands and put on gloves, a face mask, and some eye protection. Floss the teeth and give the patient an antibacterial rinse. Keep the area around the tooth as dry as possible, so that you can see what you’re doing. There will be some bleeding, so have cotton balls or rolled gauze squares available. These may have to be changed from time to time if you place them between the cheek and gum. The teeth are held in place in their sockets by ligaments, which are fibrous connective tissue. These ligaments must be severed to loosen the tooth with an elevator, which looks like a small chisel. Go between the tooth in question and the gum on all sides and apply a small amount of pressure to get down to the root area. This should loosen the tooth and expand the bony socket. Expect some bleeding. 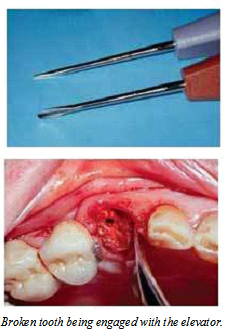 Take your extraction forceps and grasp the tooth as far down the root as possible. This will give you the best chance of removing the tooth in its entirety the first time. For front teeth (which have 1 root), exert pressure straight downward for uppers and straight upward for lowers, after first loosening the tooth with your elevator. For teeth with more than 1 root, such as molars, a rocking motion will help loosen the tooth further as you extract. Once loose, avoid damage to neighboring teeth by extracting towards the cheek (or lip, for front teeth) rather than towards the tongue. This is best for all but the lower molars that are furthest back. Use your other hand to support the mandible (lower jaw) in the case of lower extractions. If the tooth breaks during extraction (not uncommon), you will have to remove the remaining root. Use your elevator to further loosen the root and help push it outward. Afterwards, place a folded gauze on the bleeding socket and have the patient bite down. Occasionally, a suture may be required if bleeding is heavy. In a recent Cuban study, veterinary super glue (N-butyl-2-cyanoacrylate) was used in over 100 patients in this circumstance with good success in controlling both bleeding and pain. Dermabond has been used in some cases in the U.S. for temporary pain relief, but more research is needed. Expect some swelling, pain, and even bruising over the next few days. Cold packs will decrease swelling for the first 24-48 hours; afterwards, use warm compresses to help with the inevitable jaw stiffness. Also, consider antibiotics, as infection is a possible complication. Liquids and a diet of soft foods should be given to decrease trauma to the area. Use non-steroidal anti-inflammatory medicine such as Ibuprofen for pain. Some recommend staying away from aspirin, as it may hinder blood clotting in the socket. The blood clot is your friend, so make sure not to smoke, spit, or even use straws; the pressure effect might dislodge it, which could cause a painful condition called Alveolar Osteitis or “dry socket”. You will see that the clot is gone and may notice a foul odor in the person’s breath. Antibiotics and warm salt water gargles are useful here, and a solution of water with a small amount of Clove oil may serve to decrease the pain. Don’t use too much clove oil, as it could burn the mouth. In a long-term survival situation, difficult decisions will have to be made. If modern dentistry is gone due to a mega-catastrophe, the survival medic will have to take on that role just as he/she may have to take on the role of medical caregiver. Performing dental procedures without training and experience, however, is a bad idea in any other scenario. Never perform a dental procedure on someone for any reason, if you have modern dental care available to you. First off, dental anesthetic and syringes. You’re probably not going to have any. But holding a shot of strong whiskey (do NOT use Isopropyl/rubbing alcohol) or ethanol over the tooth for 5 minutes may help dull the pain a little bit. Even holding a cotton ball soaked with Oragel or Anbesol may give some relief (these contain Benzocaine). Another old fashioned dental anesthetic is good ‘ol “Clove Oil”. Unless you can inject an anesthetic at the nerve, you will not achieve 100% profound anesthesia… the above methods might give you 10-15% at best, but its better than nothing in a crisis when out in the field. 2% Lidocaine with 1:100,000 Epinephrine is probably the gold standard of dental anesthetics (we haven’t used “Novocaine” brand anesthetic in dentistry for almost 60 years now, too many allergic reactions). IF you have access to a syringe, in a pinch, you can use liquid Diphenhydramien (benadryl), for an adult, no more than 100mg’s. Injecting Benedryl does have some anesthetic properties, estimated about 50%. Another substance you can use in lieu of dental anesthetic is Ethanol (EtOH) alcohol… I don’t know how much that would “burn/sting” while being injecting, but it works by literally chemically cauderizing the nerve… it works, but the damage to the never can take several months to repair. Sometimes patients will have a permanent “paraesthesia”, that is, the numbness never wears off. So, no anesthetic and holding alcohol, anbesol/oragel, or clove oil over the tooth isn’t enough to make the tooth comfortable enough to extract it… sometimes waiting, living in pain will help…. assuming you survive the spreading abcess. As the infection/abcess progresses, this is nature’s way of trying to get rid of the tooth… the periodontal ligament becomes inflamed and during the inflammatory process the bone around the root starts to soften up… the tooth then starts to become increasingly mobile. Enough that you can either grab hold of it with your fingers to wiggle it out, or it will literally fall out all of its own accord. Forceps: even though dental forceps may look like some fancy pliers… posterior teeth are hard to get “pliers” on as most people can’t open wide enough to get the pliers on the tooth perpendicular to the roots long axis. Secondly, hardware pliers have sharp corners on them that can score/cleave the enamel/root structure increasing the chance that the tooth will break. Dental forceps have rounded edges and have a curved contour on the beaks to engage the tooth to minimize cracking/breaking it. The head/beaks of the forceps are also specifically angled in regards to removing a tooth on top or bottom. Typically, a general maxillary (top) forcep is called a 150 Forcep and the one for the mandibular arch (bottom) is a 151 Forcep. When grasping a tooth, even though the forceps may resemble pliers… NEVER “pull” a tooth! You “push” a tooth instead. Think of it like removing a fence post or tree stump out of the ground… put a chain around it, hook it to your bobcat and pull straight up, more often than not, the post/stump is going to break. So, you push the post/stump to one side, then the other, back and forth, again and again gradually loosening the soil to gently remove it. Same for a tooth. Unfortunately, looking at an x-ray or in the mouth, you can’t tell if that tooth is in Rock, Clay, or soft Topsoil. As a general statement, front teeth are easier to luxate (push/wiggle) back and forth than the back teeth and the top teeth are generally easier to remove than the bottom teeth because the bone on top is softer. Then you switch to your Forceps (150 for the top, 151 for the bottoms). 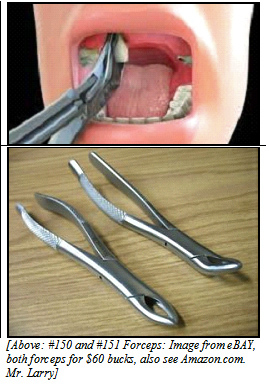 The forceps usually cost about $50-60 bucks a piece… there is no regulation against a non-dental person owning them. But you have to buy them from a dental supply company. I’d be willing to bet that if you asked your dentist nicely, they would order some for you at cost if you explained your preparedness for SHTF. Back to the “pushing”… the first thing I do is get the forceps on the tooth, I seat the beaks as far down on the root as I can get them, then I push “luxate” the tooth facially towards the cheek with steady pressure and hold that pressure for about a minute. Then I push the tooth in the other direction, towards the lingual and hold that pressure again for another minute. Then we go back and forth like this for about 5-10 minutes and then usually the tooth is loose enough that you can wiggle it out like wiggling out or removing a stuck/tight drawer. Now… what to do if you get the tooth out and the root breaks? Unless you’ve got a drill, root tip pick, and good light source, you’re going to have to leave the broken root tip in place… the majority of the tooth nerve is located in the coronal aspect of the tooth (the part of the tooth visible in the mouth) in the pulp chamber… if you break a root tip off, in most cases the body will “encapsulate” the root tip and it should be fine. As a general statement, in a dental office, the standard of care require that all root tips be removed, and if I can’t get it, I am obligated to refer to an oral surgeon. But I can’t tell you how many broken root tips I’ve seen on x-rays that are just fine. You’ll likely need to follow up with an antibiotic for a week as well. Anyway, in war, the #1 casualty is tooth related and in a SHTF scenario, I imagine dental related problems to be of great concern as well. These are the basics of tooth removal in 5 minutes…. I suggest that you search youtube.com and watch a few videos on dental extractions for further clarification. I hope this info may be of some use to you and also hope you’ll never need it. Tooth extraction is a procedure that can be done at home. You should know, however, that there are pros and cons. The pro of at-home extraction is avoiding the cost of a visit to the dentist. The con is the tooth possibly could break off, you might not be addressing potential infection and/or abscess and there may be more pain involved since you probably don’t have the same training and tools a dentist does. 1 . Determine the looseness the tooth. If the tooth is not loose at all, you are in for an extremely difficult extraction; it would be best in this situation to call the dentist. If the tooth is loose–especially if it’s dangling–you will have a greater chance of pulling it successfully with minimum pain. Baby teeth and teeth that are loose due to gum disease are easiest to extract. 2 . Brush your teeth to make sure any extra food particles are out of the way. If you are not able to do this, swish water in your mouth and spit it back out a few times. 3. Grasp the tooth by using a small square of gauze. Pull firmly. If the tooth does not come out fairly quickly, you may want to stop this process and seek a dentist’s help. Continuing to pull on a firmly embedded tooth may aggravate it and cause you a considerable amount of pain. 4. Rinse and spit a few more times once the tooth is out. Hold a clean piece of gauze next to the gum where the tooth came out for a few minutes to help stop the bleeding. If the bleeding continues, is very heavy, or if you have significant pain, call a dentist. Otherwise, you can treat the soreness with over-the-counter medication. 5. Monitor your mouth and body for signs of infection. If you notice redness and swelling at the site of extraction, if there is a foul smell or pus in or near the tooth cavity or if you generally feel bad and have a fever, call a dentist. If infection begins, make sure you receive any necessary antibiotics so your condition doesn’t worsen. Warning: Most dentists advise strongly against pulling your own teeth or the teeth of others due to the chances of complications. Antibiotics are prescribed for oral conditions related to endodontic, oral surgical, and periodontal manifestations. The antibiotic prescribed most frequently is penicillin or an analog, especially amoxicillin.